April is here! Sound the alarm! Could I not be more excited? This past weekend the sun was brilliant, and we were even graced with double-digit temperatures. I always love Easter weekend because I get to go full out pastel crazy (as you'll see in the next few OOTD posts!). Not that I don't do that on the regular, but Easter is sort of a kick-off into my pastel, pink, floral dreamland. Loving the wide leg, and baggier styles! Not to mention, they are ridiculously comfortable. Next, I think I may need to get into a pair of denim culottes to really hone in on the 90's look. They are so refreshing and I love how you can easily take them from day to night. A pair of slide-on loafers in the day, and a quick switch to a pair of pumps at night. They are sure to make a statement. Hi, mom jeans! I was searching high and low for a pair that would work for my body type and finally, American Eagle came to my rescue. I could not believe how much I loved them! Warning-- these are a total man repeller, LOL! Brandon cringes when I wear them. But paired with a white oversized tee, or this Bonjour tee, I am sold! Feeling like I should go park a vintage wagon somewhere in Venice Beach and just chill for days. These are also a great transitional piece. They pair equally as well with booties as they do with flats. I'm just obsessed with this pair I'm wearing in this post! I was so skeptical when I brought them to the fitting room, but immediately I fell in love. Wear them to the office, out at night, or on a casual Sunday. They have some retro vibes that I love, too. Pair elements of all the styles together! Go wild here and embrace all the fun new denim styles this spring. There are also great jumpers and overall styles that feature a few of the different looks in one. There's also all the embroidered styles and bejeweled styles to take advantage of. It's a new season and the perfect opportunity to get into some new looks. I'm breaking away from my go-to skinny jeans, how about you? P.S. Check out the fabulous new collection by Soukh. A beautifully curated collection of treasures from all around the world! No two bags are the same. So in love with this outfit! Denim culottes is something incredibly cool and must-try. They look unique and original. Sure, you need to think over your outfit before wearing them, but it's totally worth it. 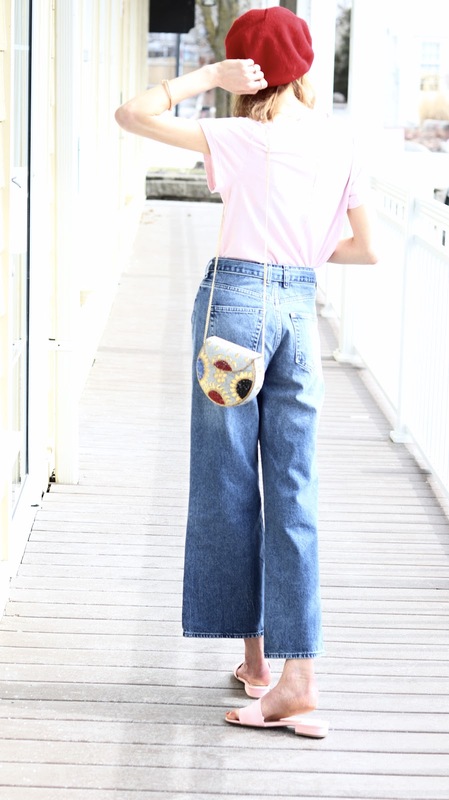 I made a nice post about denim culottes, I think it's worth to take a look: http://wardrobefocus.com/denim-culottes-2018-tricky-fashion-trend/ Hope you gonna like it, as I tried to gather only the best outfit ideas completed with denim culottes.